Solving and avoiding common pool problems. Inground Pools: Solving Maintenance Problems and Making Choices..
Scroll down to browse through some archived SWIMMING POOL questions and answers. Please click the Problems Link, on top of every page, to access a complete listing of Pool Problem subjects, an alphabetized Website Table of Contents, Pool Equipment Information, About Alan Biographic Material and a Pool Glossary. Use the other links to access additional subject information. More information about some new and unique products, for pools and spas, can be found by visiting The Website Store. You'll never know what you'll find and that's always fun. Be better prepared and avoid costly problems! Caring for fiberglass inground pools. A pool requires proper care, in order to preserve its appearance and extend its life. Water testing helps avoid conditions that might damage the pool equipment or make sanitizing less effective. A ColorQ all-digital tester can measure all the common test factors. There's a model, for every pool and sanitizing need. Swim endlessly in place, without having to spend a fortune, using an Aquatic Fitness Trainer. For a bit over $200.00, you can swim and train, without having to turn around, just like the pros. Salt chlorine generators are a better way to do chlorine, providing more control and helping to avoid algae and sanitation problems. Stains can be removed with a MetalTrap Stain Reversal Kit and heavy metals can be eliminated, at the source, with a MetalTrap Filter. 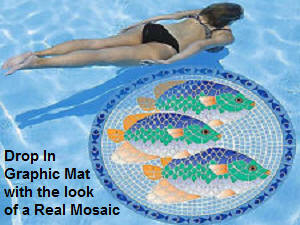 Add a drop-in, Premium Pool Graphic Mosaic Mat your pool will take on a great new look. Get better circulation, by replacing standard return jet fittings, with The Circulator. Better circulation helps everything work better. A Solar-Powered, Robotic Pool Skimmer/Cleaner works autonomously, to remove floating leaves and debris, before it settles to the pool floor. A Portable, Hand-Held Vacuum is an easy way to clean a pool, without hoses to tangle. A Water Sweeper Broom cleans the area around the pool, so less debris gets into the pool. Cleans 3 times faster, while using 1/3 the water. How to maintain and care for an inground pool? Most inground pools are available in an endless variety of shapes, sizes, depths and configurations. Included are commercial and residential, outdoor and indoor, community and private and big and small. The pools can be constructed from a variety of materials such as: steel, aluminum, concrete, plastic, wood, cement blocks and fiberglass. The walls can be covered with masonry finishes, tiles, vinyl, fiberglass, paint and other coatings. Some types of pools are better suited for certain uses and/or locations. Inground pools can be accessorized with a full range of convenience features. Different types of pools can encounter or require varying maintenance requirements. For your sanitizing needs, for can consider a salt chlorine generator, a solar-powered pool mineralizer or an Solar UV Sterilizer. For keep your pool clean you can use a robotic pool cleaner, a portable, battery-powered pool vacuum or a water sweeper broom, for cleaning decks, patios, walkways and more. If problems arise, refer to the Pool Problems Page, as a source of problem-solving information, broken down into various categories. Scroll down the page and click on the linked keywords, catch phrases or images, in the archived answers below, to access additional information, on that topic or product. Do you know what's in your water? Optimizing the water chemistry helps maintain proper swimming conditions and allows sanitizers, to work more effectively, If you would like to avoid problems, with stains and discoloration, due to the presence of metals, you should be testing for iron, copper and, possibly, manganese. Understanding, if the potential for a problem exists, allows for appropriate, preventative treatment to be taken. This helps select the best treatment option, to avoid stains and discoloration. For information about our full selection of testing options, visit our Test Equipment Store. For information about discoloration and stain treatment options, visit our Stain Treatments Store. Understanding the nature of the problem, should be step one. ► Swimming Endlessly In Place? I have a small inground pool (12' x24') and I would like to be able to swim continuously, without having to turn around. I have seem add-on pump systems, that create a current so you keep swimming straight ahead. However, the cost is more than I am prepared to spend. Are there less expensive options. Swimming into a current may sound like a good idea, but it may not be the best way to swim endlessly in place, based on what I have heard. For about $200.00 you can add an aquatic fitness trainer. It utilizes a flexible pole, a tethering line and a belt. Belt it on, wade out and start swimming. There are several ways to mount the pole: deck mounted, ladder or rail mounted or used with a portable water-filled base. There is even a portable model, to take away with you. It even works with above ground pools, so you pool size is not a factor. This is professional-grade equipment, that is use to training swim professionals and others. The combination of the flexible pole and the tether will really make you feel like you are swimming endlessly. This is just what you are look for. If this website was helpful, in solving your problem, please consider joining our E-Letter Mailing List. You'll receive E-Letters, with helpful information, new product updates, suggestions and sale announcements. I hope that I have provided the solution. My wife and I are planning to have a vinyl inground pool built next spring. We have a large backyard with some natural features that we would like to incorporate into the overall design. Most vinyl inground pools seem to be rectangular and boring. I know that a rectangular shape is more efficient and probably costs less, but it is not what will make us happy. Is it possible to get creative with a vinyl liner inground pool? We have the time to check things out and we want to get it right. Thanks for the time taken. Today you can get a vinyl lined, inground pool in an endless variety of shapes and sizes. You don't have to settle for straight lines! Computers have made a big difference in the construction and design of both the pool and the vinyl liner. Dealing with experienced and reliable companies is the key to your project. Good luck with the pool and I hope that I have been helpful. ► Questioning The Pool Capacity? We recently moved into a new house, that has an inground pool. I have owned a house with an inground pool, before, and I don't think that I was provided with the correct pool gallon size. I would like to verify the gallons, to help maintain the proper water balance. Is there an easy way to do the calculations? Thank you. All you need is the dimensional information. You will find the necessary calculations, for all shapes and sizes, on this website page: Calculating Pool Volume. It does help to get a reasonable accurate idea of a pool's capacity. Enjoy the pool. Use a Premium Pool Art Graphics Mat to decorate your pool floor. The image appears to be tiled on your pool floor, but that's just an illusion. Actually, you simply set one of these colorful graphics on the water and push it to the bottom, with a pool brush. Its weight keeps it there. Choose from 9 attractive designs, plus a custom monogram model. Most are available in 3 sizes: 47" diameter, 23" diameter or 10.5" diameter. No adhesives needed and installation is just that simple. To remove or place elsewhere, just lift it off. I have decided to have a pool installed in the spring. We have decided on a gunite pool. Our space is limited, so it will be a basic 14 x 28 pool. What should we look for from the contractor, other than choosing the finish, color and equipment, in terms of references and the like. Reference checking goes without saying, as does looking at some completed jobs. Ask how long he has been in business under the same name. Has he used other business names? Is he insured, licensed and bonded? Get the warranties spelled out in plain language. Will he provide complete start up instructions and service after completion? Will he clean up the job site? Will he be responsible for any damage to a neighbor's property? How will damage to your sprinkler system be handled? Who is responsible for applying for and obtaining permits? Good luck with the project and enjoy the pool. We are undecided about getting a gunite pool or a vinyl pool? I know that the gunite pool will cost more, but what about the maintenance and the life expectancy of the pool. We live in Virginia, if that helps. Generally speaking the chemistry of a vinyl inground pool is easier to maintain than that of an inground gunite pool. Both types can be constructed in a variety of shapes and sizes. Both can be equipped with similar filters, pool vacuums, heaters, covers, equipment, accessories and features. Eventually the vinyl liner will have to be replaced. Some pool finishes, such as exposed aggregate, can create unique looking finishes that are long lasting and less prone to chemical interaction. Both types can last for decades with reasonable care. Today's vinyl liners look infinitely better than the liners that were used in years past and rival a gunite pool in appearance. What about a fiberglass pool? Fiberglass pools are beautiful, easier to care for than gunite and priced between vinyl and gunite, The choice is yours. Enjoy the pool! Browsing through the website, I became intrigued by pool automation. I would like to maintain the pool myself, but I don't always have the time to spend on things. The pool is 20,000 gallons, inground with a plaster finish. What can pool automation do for me? Thanks for the input. A lot! 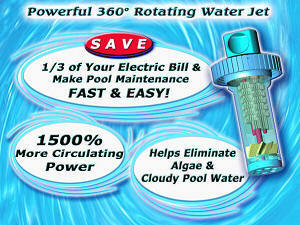 Pool automation can turn your filter on and off. A Salt Chlorine Generator can be made to turn on and off with the automated filter cycle. This equipment will produce chlorine right in the pool, with a one time addition of salt to the pool. A dial will allow you to increase or decrease the amount of chlorine being produced. The heating of the pool can be activated with the automated filter cycle and controlled to the desired temperature. The cleaning of the pool can be accomplished with a controllable robotic pool vacuum or an in-the-floor cleaning system. There are automatic pool covers, automatic pool lighting and pool security. Pool automation can eliminate much of the daily work required for sanitizing, maintenance, heating and cleaning. I hope that I've kept you intrigued. Good luck. ► Draining An Inground Pool? I need instructions on how to drain an in ground pool. ASAP! Thanks! I'm glad that you took the time to write. There is no way that I can tell you how to drain the pool. You provided no details. Depending upon the type of pool - gunite or vinyl - the procedures could be quite different. I suggest that you direct the question to the builder or someone very familiar with your type of pool. Remember this! Vinyl liners can shrink and the walls are held in place by the water, as well as the construction. A pool should be emptied only as a last resort. Good luck. ► Well Water Caused Staining And Discoloration? We had a 18' x 36' vinyl inground pool installed. We had the water tested and had a list of chemicals to add. I probably should have told the store that I used well water, but I did not realize it was that important. Now I know better. The water turned into a tea colored solution, after I added some pH booster and chlorine. There may be some brown stains, the deep end. What should I do to make this right. It seems apparent that the water contained iron and other metals. Dealers don't always run these tests and metals don't always show up. Pools that turn amber to rusty, brown or blackish, after addition of chlorine or pH raising chemicals, usually have iron and other heavy metals present. This is especially true, when well water is used. If you had filtered the well water, used to fill the pool, through a METALTRAP Filter, the heavy metals would have been permanently removed. When the pool needed to be topped off, all the new well water could have been passed through the METALTRAP Filter, to prevent new additions of metals. Removing metals, as the pool fills is the best insurance against future problems. There are chemicals means to treat metal problems and/or remove the stains they cause. Not all of these chemicals are equally effective, some are ineffective at higher pH levels and others contain phosphates, which can lead to other problems. 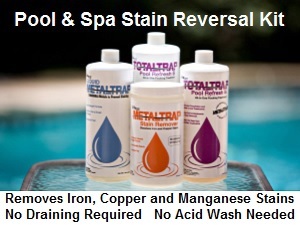 I suggest using the MetalTrap Stain Reversal Kit. It will help remove the stains, allow you to filter and vacuuming the metals out of the pool and help prevent a recurrence, after chlorine is added. The kit contains everything needed and is phosphate free. Once completed, using a METALTRAP Filter, which attaches to the garden hose used to add new water, you can avoid adding more heavy metals, each time the pool is topped off. Good luck and I hope that I've been helpful. ► Need To Periodically Drain A Pool? I live in Scottsdale Arizona and I have a diving pool. I have lived here for 9 years. My pool service is telling me that I need to empty the pool to restore the chemical balance and address issues cause by hardening of the water. It seems like a big task and I want to check it is really necessary before proceeding. Under what circumstances is this required? Thanks for your help. In the sunbelt, and when dealing with pools that are not winterized, the dissolved salt content (TDS) will constantly creep up. In the north, pools are winterized and this replaces about 1/4 of the water every year. This eliminates the buildup or, at least, reduces it greatly. If you are using a stabilized chlorine, the cyanuric acid level will build up. The only way to lower it is to replace water. You certainly want the cyanuric acid level under 100-150 PPM. If that is being done, no other water replacement should be necessary. TDS can be tested, using a simple TDS PockeTester. If you are using liquid chlorine or a salt chlorine generator, as two examples, there will be a build up certain salts, over time, increasing the total dissolved solids (TDS). High TDS can lead to clarity, sanitizer ineffectiveness or scaling issues. It would not be unreasonable to replace the water every five years or do a partial replacement, starting after 3 or 4 years: sooner, if there is evidence of high TDS or clarity, high hardness or scaling problems. The TDS spike, contributed by the salt used with salt chlorine generators, will result in a higher TDS, but the problems involve the build up of salts, other than sodium chloride. Comparing the TDS of your tap water with that of the pool, will provide and indicator of how much the dissolved salts have increased. 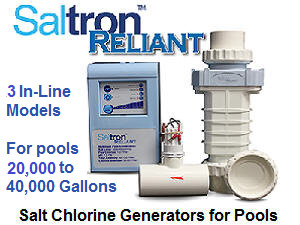 If you have a salt chlorine generator, deduct the PPM of salt, that is being maintained. Draining an inground gunite pool can involve the risk of the pool popping out of the ground. However, this is only a problem in high water table situation. In your case, I doubt there is a problem. Basically, this is your call, especially, if the water seems clear and problem free. I hope that this information proves helpful. ► All The Bells And Whistles? I'm getting a new inground pool,18x36 with a 4x8 center step, 3ft shallow end ,8ft deep end, Will be installing a heat pump. What are the 2 best salt water generators to consider and why? Sand filter or cartridge filter and the best one to get? Pressure sided or suction sided cleaner and 2 best to consider. I live in Kansas. Thanks in advance. So far as a heat pump is concerned, I suggest that you look into its suitability, for your location. Ordinarily, I am not a big fan of sand filters, based on the e-mail I receive. However, if you want a sand filter make sure that you use a zeolite sand filter replacement filter media. It makes all the difference in the world and is even better when used with a salt chlorinator. My choice would be a sand filter with zeolite. For a pool cleaner, I would choose a Robotic Pool Cleaner. Unlike suction-side cleaners, it does not interfere with the skimmer action and unlike pressure side cleaners, it requires no separate line or booster pump. It requires no installation, is economical to operate, has a built-in microfilter and can clean all pool surfaces, while acting as a moving main drain. I hope that this information will prove helpful Good luck and enjoy the pool. We have an 18 x 36 inground pool and we built a retaining wall all along the back side. We would like to know if we can put the filter on the back side so it is out of sight. But, the filter would be 4 feet below the top of the pool. Thank you. Filters are sometimes placed below grade. Just understand that a leak can cause water to drain out of the pool and not just the lines or filter. It is done, especially when there is no other option. The longer the filter run, the less effective will be the pool pump. I hope that I have been helpful. Enjoy the pool. ► Trying To Decide About A House With A Pool? Hello there! I am in the debating process of purchasing a great home. BUT, it has an inground pool. I have 3 kids (ages 14, 5 & 4) and, of course, they would love a pool! The thought of it being like on vacation in our own back yard seems wonderful, however, I am concerned about what I may be getting myself into. I've never had a pool so I have no clue as to whether it is an expensive luxury? Huge liability? Where would I start to learn all the basics about maintaining an inground pool? Or should I steer clear of pools? Piz, plz advise ASAP. Many thanks in advance for your time. Sincerely. Most likely all those horrors, you're think of, were about people that neglected the pool or thought that because it wasn't being used, chemicals weren't needed. Hopefully, you'll be like the millions that take care of the pool and have lots of pleasure. It is easier than ever! There are salt chlorine generating systems that make the chlorine right in the pool: no chlorine to store or handle. There are Robotic Pool Cleaners that make short work of keeping the bottom and walls clean. There are pool safety covers that automatically cover the pool at the press of a button, provide safety, help keep the water warm and cover the pool for the winter. Testing the pool water can be as simple as dipping in a test strip or an all-digital ColorQ Water Analyzer. If you're concerned about safety, there are pool alarms, yard alarms and gate alarms. Local pool dealers can test the pool water and get you off on the right track. The cost of electricity and chemicals needs to be considered, but it is modest compared to the return. I say go for it! If you run into a problem, I'll be here. Best of luck with your decision. I was losing about an inch of water daily and was convinced that I had a leak. The pool is a 18 x 36 vinyl inground that is about 3 years old. After checking all the fitting, I decided to try a dye solution and see if that could help locate the leak. To my great surprise, I located the leak. It was in the shallow end about 2 feet in front of the steps. I assumed that someone stepped on a sharp pointed pebble or something. I have several questions. Can I use a piece of the original vinyl, which I have, as a patch. Is there anyway to do this without draining the shallow end, as I don't want to risk damage to the pool or liner. I appreciate the opportunity to ask these questions. Yes, you can use the original liner material as a patch. Lucky, that you have a piece. Boxer Adhesives manufactures a complete line of vinyl plastic repair products and adhesives that can even be used underwater. Just use it as directed and make sure that you trim the corners off the patch, in order to help prevent them from lifting. Locating the source of the leak was the hard part. The repair will be the easy part. Good luck and enjoy the season. My question is how may returns should a 20' x 40' (Roman both ends, 8' Roman Dual Seat stairs on side) have? We are in the process of purchasing the pool and we wanted jets in the stairs too. What are the pros and cons? I have heard that the jets can leak, is this true? Most pools come with 2 jets if I am not mistaken, but is there a complication once 3 or more jets are added (like installed in the 8' Roman Dual Chair stairs) Any advice would be appreciated! Thanks. Most popularly-sized, inground pools come with two returns. It is mainly a matter of economics, as more returns will add to the cost. Obviously, the more lines and connections that are added, the greater the possibility of a problem. Workmanship matters. However, adding a pair of additional returns is not something that should present construction quality issues, if done properly. Lots of pools are built this way. Enjoy the pool. I am so confused about which type of vinyl-lined pool to purchase. We've narrowed it down to 2 companies. We can't decide between a steel-framed pool or thermoplastic one. Are there pros and cons to both? We are so confused. The thermoplastic pool I more expensive. What do you think? Both pools can last a long time. Steel walls can be adversely affected by poor drainage and corrosive soil conditions. I have no way of knowing if this presents a potential area of concern. It is something to discuss with the builder. Plastic wall construction can be very long lasting and is resistant to corrosion. Both offer flexibility of size and shape. The plastic walled pool is probably better insulated for heat retention. That brings us back to cost! Just as important is the reliability of the builder. Check references! Ultimately it is your decision. It might help shed some light and help with the decision. Good luck. ► Scrubbed The Liner Too Much? A roofing nail somehow ended up in my pool, while a new single roof was being installed. I didn't notice it for at least a few days, because the pool was not being used. I add some metal remover and it did not remove the stain. So I tried to use a scrubbing pad to remove the stain and ended up scrubbing off some of the liner print. Is there any product that can be used to add some color back? Thank you. There is nothing that will colorize the area, that I know of. However, you should be able to cover it over with a Premium Pool Graphic Mosaic Mat, that requires no installation. They are available in various sizes and designs. For example you could use a Dolphin or Turtle design and it would look like it was part of the pool. In the future, if you get a stain, try using METALTRAP Stain Remover and Liquid METALTRAP. I know that combination would have removed the stain, without any scrubbing. Unfortunately, vinyl liner designs are only printed on and cannot withstand harsh scrubbing. I hope that this information will be helpful. Alan, I've almost gone through every aspect of your website and have learned a great deal on what I hope to be a fun filled future as a pool owner. I'm in the process of building a new home with an inground, indoor fiberglass pool. The pool will be in its own walled in environment with a dehumidifying heating system. I've read somewhere that chlorine shouldn't be used as a sanitizer for an indoor pool because the byproducts can be carcinogenic. Can you verify this for me? My hope was to use a salt chlorine generator but now I'm having second thoughts. Are there any other concerns I should have with an indoor pool (i.e.. is a chlorine stabilizer needed). Thanking you in advance. Read enough and everything seems to cause cancer. The odor of chlorine, that you smell indoors, is not chlorine. It is chloramines a nd it is known as a bad actor. It is odorous, irritating and ineffective. High cyanuric acid levels are another potential problem. The good news is that chloramines are completely destroyed, as the water passes through the salt cell and there is no build up of cyanuric acid (chlorine stabilizer. Your pool is indoors, so you do not need any stabilizer! The fact that the pool is fiberglass will simplify the maintenance of the pool water chemistry because of the inert nature of the fiberglass. Basically all you will have is salt, chlorine and some innocuous pH adjustment chemicals. There is a long safe history of chlorine being used in pools and drinking water. Bad press about chlorine, usually refers to its manufacture and the release of mercury. This has nothing to do with swimming pools. A salt chlorinator will go a long way towards helping to maintain the best appearance of the pool finish, because it helps avoid ultra high chlorine levels and corrosive low pH conditions. It also avoids the addition of byproducts, such as cyanuric acid. I hope that I have been of assistance. Alan. We live in Virginia Beach and are looking at a vinyl liner pool. All salespeople maintain they have the best support for the liner. Do you know how the new plastic/polycarbonate support frames hold up? Does it matter what is beneath the liner on the pool sides of the inground pool? Thanks. It certainly does matter. You want the walls constructed, in such a manner, that they are securely anchored in place and are not prone to movement or the effects of corrosion. Shifting walls will lead to serious problems. How the components are put together is very important. Polycarbonate is not just plastic: it is strong and tough to the point of being almost unbreakable. It's what bullet proof glass is made of. Years ago, there was a TV commercial showing a premiere power pitcher throwing a baseball, at a polycarbonate pane. He couldn't break it! Vinyl lined inground pools are built from all sorts of materials: steel, aluminum, concrete and structural plastics. You should seek out a dealer that has the kind of local reputation and product that gains your confidence and suits your budget. I hope that I have been helpful. Alan, I am relocating to Florida and I am planning on having a house built with a pool. I have never owned a pool before and don't know what to look for to avoid future problems. Any suggestions? I would also like to know what to expect as far as time and cost to maintain a pool. Thanks. A lot will depend upon the pool and your budget. Your first decision should be w hat kind of pool: gunite or fiberglass. A pool is a long term investment, so choose carefully and check out the builder. Assuming that it is an inground pool, it may require a few hours a week to maintain the water chemistry and make the proper adjustments. If it is within your budget you could use a salt chlorinator, as a means of eliminating most of the chemicals. Cleaning the pool, depending upon location can involve work. This too can be simplified with the addition of an automatic pool vacuum. Reading up on water chemistry and proper filter operation will help get you off on the right track. Browsing through the archives will help educate you about pool maintenance. Cost will depend upon pool size, location and usage. A ballpark figure might be $1000-2000 per year, but it is not etched in stone, as it can depend on size, construction, usage, sanitizer choice, etc. This does not include electrical costs. I hope that I have been helpful. Hello, My husband & I have 6 kids & think an inground pool would be a great family pastime but were wondering about the extra cost of running & maintaining the pool once it's installed. We've gotten several packets from local pool installers with the cost of the actual pool but want to make sure we're not getting in over our heads with the cost of upkeep. We only want to consider an inground. Thanks. The cost of inground pool ownership includes the electrical costs as well as the cost of the chemicals. The horror stories, that we have all heard, are usually about people that neglect the care of the pool water. Many people try and get by with chemical additions only when the pool is going to be used or on too infrequent a basis. Algae doesn't follow a schedule. With proper maintenance the cost of chemicals can be as little as a few hundred dollars per year. Pools that allow themselves to be turned into algae farms end up costing much more. With 6 kids (and their friends) expect the pool to get considerable use and for this reason it is imperative that the pool be equipped with a means of adding sanitizer on a regular basis. Today there are devices that make sanitizing easier and more consistent: salt chlorine generators, Solar UV Sanitizers and Solar-Powered Dual-Ion Purifiers/Mineralizers. These devices reduce chemical usage and help to repay their initial cost. Cleaning a pool can be a chore, but there are robotic pool cleaners that vacuum the bottom and help improve circulation in the corners. Water testing is important to help maintain the proper chemical balance and today it can be done with a ColorQ Water Analyzer, which eliminates the color-matching and guesswork. Pool opening and closing can be done by the pool owner. Heating a pool can be done inexpensively with a solar heating system. Bottom line is that you're talking about hundreds and not thousands of dollars. Actual cost will vary upon pool size, length of season, utility rates equipment and how the pool is operated. I hope that I have been helpful. Go for it! ► Considering An Inground Pool? Hey Alan, I'm strongly considering buying an inground vinyl lined pool. Can you tell me the maintenance involved with this? Thanks. It is a simple question, but a long answer. The worst thing you can do is use water that comes from a non-potable source. I t is not difficult to maintain the chemistry or add the necessary chemicals. Depending upon your budget, there are devices and gadgets that will help add the chlorine, clean the pool and warm the water. A good filter makes a big difference - go with DE or if you choose a sand filter, fill it with a zeolite sand replacement filter media instead of sand. It will rival DE in performance. They rarely ever write me complaining about cloudy water. Do the recommended maintenance and you should have few problems. Neglect things and you'll have problems. If you live up north, proper winterizing always makes springtime opening easier. Browse through the website and you'll see a cross section of the problems that are encountered. It is hard to over-emphasize the need for reliable water testing. I would suggest a ColorQ tester. It is all-digital and eliminates all the color matching and guesswork. Go for it. Good luck. I'm in the process of trying to build an inground pool and I'm not sure what are the best materials to use and such, what is the best equipment and such. Don't get me wrong, I'm not building the pool myself. I'm building a house and they have a different sub-contractor to do the pool building for me. But in order for me to know what is the best things to discuss with them, I would need to understand more about inground pools and what are the best materials, tiles and stuff to use. They throw out terms like marcite, pebbles and stuff to use, but how do I know which one is the best for the money? They tell me about fences, alarms, pool covers, etc. But how do I know I know which is the best or safest method to use. I have a 2 year old daughter, so I would want the safest thing for my family. Automation for pools, heater for pools? I like both, but I'm not sure which brand is best. What kind of heater to use? Etc. I would like to build a classic, rectangular, inground pool, 14 X 28. Please let me know if you have some information, or if you know where I can find some help on this. I would just like to know and do my homework before I talk with the pool builder, so that I can get what is best for my pool. FYI, I'm building the pool in Palm Harbor, Florida. If you have any information about pool builders in that area, I would appreciate hearing from you. I think your book will be very helpful for me, after the pool is built. Thanks again for your help. I am a chemist and not a pool contractor. While I am willing offer advice, please bear in mind that I don't have all the answers. I'll try and point you in the right direction, but you need to do some comparison shopping. You're going to spend a considerable sum and you want to get it right. That's more important than saving a few hundred dollars on a component. The terms marcite and pebbles refer to types of pool finishes. Marcite is a smooth plaster and the pebbles sounds like it is one of the aggregate finishes. They all do the job, but they look different. Have the contractor show you samples of marcite and various exposed aggregate finishes. The cost differences are not huge and I suggest that you go with the look that you prefer. Fences may be required as per the building code. If you want something that will provide real safety and help cut your heating costs, I suggest that you look into an automatic pool safety cover. So far as a heater is concerned, I suggest that you go with a heat pump. The economics are very favorable. It works in-line and assures that all water returned to the pool is sanitized. It does require some installation, so at the start of building would be an ideal deal time to add this system. It is easily automated. Pool Automation can be provided by a controller and can include a chlorine salt generator to provide chlorine for pool water sanitizing and a robotic pool cleaner. The automatic safety cover, heat pump and pool lighting and more can be controlled by a pool automation device. I hope that I have been of help. Good luck with the pool project. We are having a gunite pool built in our backyard, and we have completed the gunite phase. During a rainstorm last week, our pool got water under it and raised on one side about 2 feet and 1 foot on the other in the shallow end. We've drained the water from under the pool, but of course it did not go all the way back down. Any suggestions on what we should do? We've been told to wait till the weather dries things up some, then possibility fill the pool to hope it will go down some. Then to spray concrete under it to stabilize it. Any suggestions would be great! P.S. The plumbing is fine and we didn't have tile or concrete done yet! This is definitely out of my area of expertise. You need to seek some expert advice. I'm a chemist and not a pool builder. I'll tell you what I know and you need to take it from there. There is something called a hydrostatic pressure relief valve that is supposed to prevent a gunite or fiberglass pool from popping out of the ground, in high at table areas. Do you have one? The rainfall caused a rise in the water table and your pool, being empty or nearly empty, floated up. If there was ground collapse, it is possible that the solution will be complicated. It could be as simple as just filling the pool. I don't know and you need to find a person that does know. Is there a warranty? Good luck and let me know how it turns out. ► Vanishing Edge Pool Feature? Hi Alan. I'm having a vanishing edge pool built. Should the overflow tank be tiled? Regards. This is really something that you need to discuss with the contractor. The overflow will be in contact with the feature and will interact. Therefore, it must be treated to make it water proof and as chemically resistant as the pool itself. Plaster, tile or paint will all work. It is a matter of whether or not it can be seen and cost. Good luck with the pool - I'm sure that it will be a great looking pool. ► Hydrostatic Pressure Relief Valve? Will a gunite pool have a static relief valve installed in it? If so where would it be? I have a gunite pool that was drained for cleaning and floated up about 8 inches at the deep end. The movement broke up the concrete walk and I am sure damaged all of the piping. The pool is 25 ft X 35ft. Thank you very much. I am not an expert on this matter, but it seems that there are only two possibilities: there is no hydrostatic pressure relief valve or it failed. Not all gunite pools have this feature. If present it could be visible in the bottom of the deep end or could be part of the main drain installation. A HPRV should be installed, if the pool is being constructed in a high water table situation. If your pool was built during a drought, the need may not have been apparent. I am not sure what the remedy entails. You need to discuss this with an experienced contractor. Good luck with the resolution of the problem. ► Hydrostatic Pressure Relief Valve Decision? Alan, we have a pool being built 10 feet away from the bay in Newport Beach CA. The contractor seems to think that we do not need a hydrostatic valve. Can you please respond and tell me the right direction we should go? Thank you so much. A hydrostatic pressure relief valve is used to prevent a concrete or fiberglass pool, from popping out of the ground, in a very high water table situations. You may be close to the bay, but unless you're in a swamp, it probably really isn't necessary. If the excavation hole is NOT rapidly filling with water, the contractor is probably correct in his thinking. But, a storm or weather event could change that, so it might be worth considering. Good luck with the project. Alan, when opening the pool this year we are having a problem with water under the pool liner. It is making the liner bulge out. I am not sure if this is caused by a leak in the liner or if I am having some other drainage problems? If the pool is full there should not be any water bulging behind the liner. The pressure of the water in the pool, pressing up against the walls, should prevent this from happening. It seems more likely that the bulge is from the walls. Heavy rainfall and or poor drainage or shifting ground could have caused the walls to bow inward. Is it possible that this is what you are seeing? If so, I suggest that you contact the builder and discuss any recommendations that he might have. Good luck with the problem.